Whoa! It’s a double rainbow! It’s almost a triple rainbow!…what does this mean? 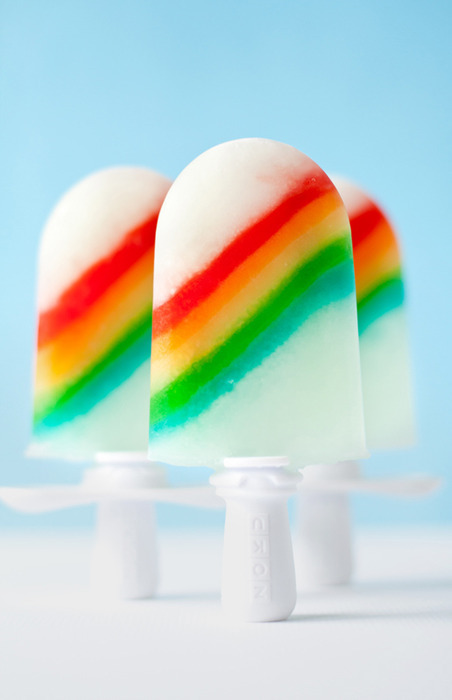 We thought it would be fun to share a recipe for a rainbow Quick Pop since there’s been so much talk about rainbows lately. Especially double rainbows! Preparing this many stripes takes a little bit longer than usual, (and may not yield as many rounds as usual), but it’s a lot of fun. Use the Zoku Tool Kit for best results and see our tips here for making really neat stripes. Remove The Quick Pop Maker from your freezer; insert sticks. Set the Quick Pop Maker to lean on the short side of the Angle Tray (included in the Zoku Tool Kit). White layer - Using the Zoku Siphon (included in the Zoku Tool Kit), squeeze the ½ ounce of limeade into each cavity; allow to freeze completely. Red layer - Using the Zoku Siphon, squeeze ¼ ounce white grape juice into each cavity directly onto the limeade layer; allow to freeze completely. Orange layer - Using the Zoku Siphon, squeeze ¼ ounce orange juice into each cavity directly onto the red layer; allow to freeze completely. Yellow layer - Using the Siphon Tool, squeeze ¼ ounce pineapple juice into each cavity directly onto the orange juice layer; allow to freeze completely. Green layer - Using the Siphon Tool, squeeze ¼ ounce white grape juice into each cavity directly onto the pineapple juice layer; allow to freeze completely. Blue layer - Using the Siphon Tool, squeeze ¼ ounce white grape juice into each cavity directly onto the green layer; allow to freeze completely. Remove the pops with the Super Tool and enjoy!